Bengaluru, January 31: “HSFC shall be responsible for the implementation of Gaganyaan project — which involves mission planning, development of engineering systems for crew survival in space, crew selection and training and also pursue activities for sustained human space flight missions. HSFC will take the support of ISRO centres to implement the first developmental crewed flight.” A statement said. Human Space Flight Centre (HSFC) is operational now after its inauguration by Dr K Kasturirangan, ex-Chairman, ISRO. Chairman Dr K Sivan and other officials too were present. The facility is next to ISRO HQ. 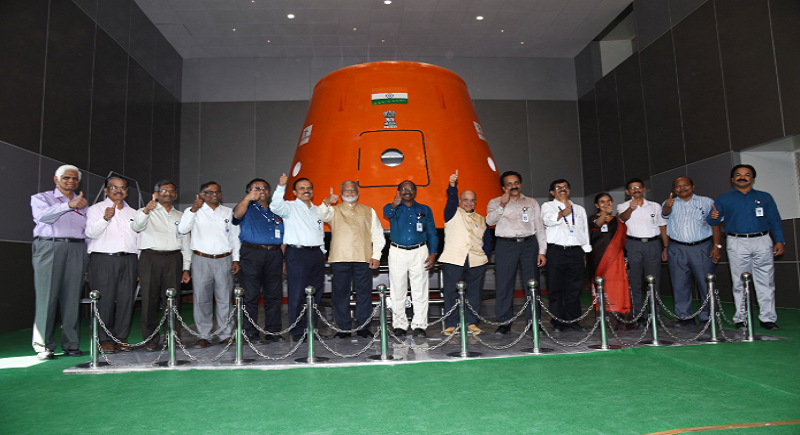 A full-scale #Gaganyaan crew module model also unveiled. HSFC will take the support of the existing ISRO Centres to in the development flight of GAGANYAAN under Human Space Flight Programme. Dr S Unnikrishnan Nair is the founder Director of HSFC and R Hutton is the Project Director of GAGANYAAN project. The Union Cabinet gave its nod for the Rs. 9,023 crore programme recently. The government had announced on 15th August 2018, on the 75th year of Independent in In 2022, ISRO’s first crewed mission is set to happen.